We have prayed so fervently about where we thought God was calling our family next. Praying even that He would halt any efforts we were making to adopt again, if it was not the best thing for our current children and the child to come. Time-after-time, He has confirmed to us that we are to adopt one more child in this current season of life. Final confirmation came this past Thursday when we received amazing news. We have another daughter!!! Not all countries and cultures are comfortable with the idea of a large family. God led us to the country of Philippines, and against the odds, they granted us pre-approval to adopt a tiny little doll baby!! She has dark hair and dark eyes, and is three years old. Her brothers and sisters helped choosed her name, Ellie-Kate, because 'Ellie' means "God is my light." We have been told she is super cuddly and loves to be in someone's arms. She is rocking an extra chromosome, meaning she has Down Syndrome, and we are blessed beyond measure to call her ours. Because of the country guidelines, we are unable to post her picture. But in the midst of all our praying, and others praying with us, we had the idea to send a picture to anyone who wants to be part of changing her story! 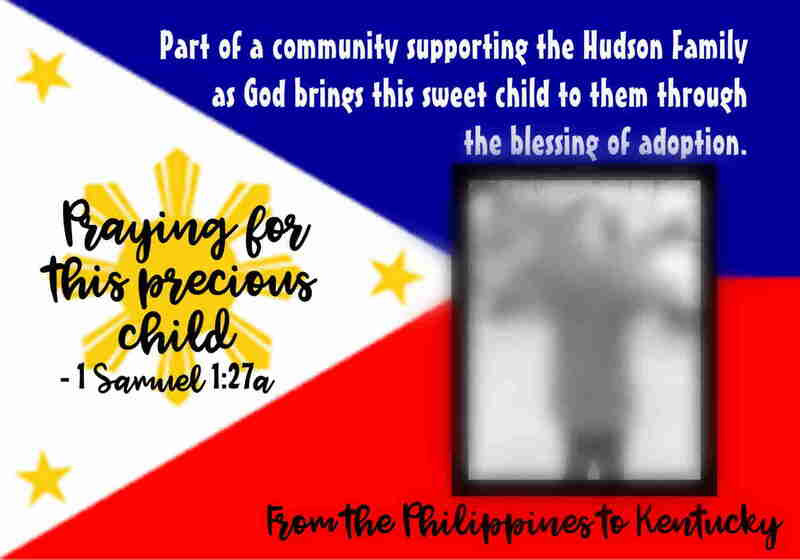 We are making these beautiful 3x5 "Prayer Magnets" which will have an un-blurred photo of our little angel. You can stick these on your refrigerator as a reminder to pray for this gorgeous girl and her future family! Every single family or individual who requests a magnet will be named in Ellie-Kate's lifebook, a forever reminder to her and our family of the prayers and community pouring out to bring her home! Buying a photo magnet like this through an online source like Shutterfly would cost $8 plus tax and shipping. To do them ourselves, our expenses include postage and printing, which costs about $3 each. We are suggesting a donation of $7 per magnet. The $4 raised once expenses are paid would go 100% to adoption fees. If we could send just 250 magnets, that is 250 households praying for this girl, and $1000 toward adoption expenses!! Look at what just $4 could do! We hope you will consider being part of our adoption and prayers for Ellie-Kate! Instructions: your donation can be sent through paypal at www.PayPal.Me/LoveMakesaFamily. Make sure you choose "sending money to family or friends" so we are not charged a fee, and please put your mailing address in the "Notes". You can also contact me for our mailing address to drop a check in the mail. We will print and mail your magnet asap! Thank you for your prayers! Hope Your Day Stacks Up to All You Want It To Be! June 15 = Received notice that we have PA (pre-approval) for Ellie-Kate!! !